Are you looking to plan a beachbound birthday bash for yourself or a friend? Miami is a hotspot for culture, nightlife, plenty of sunshine, and an overall good time. It’s the perfect place to bring a group of your favorite people for a couple nights out on the town. Soak up some rays, grab a cold beverage, and most of all, be open to all the possibilities in Miami. 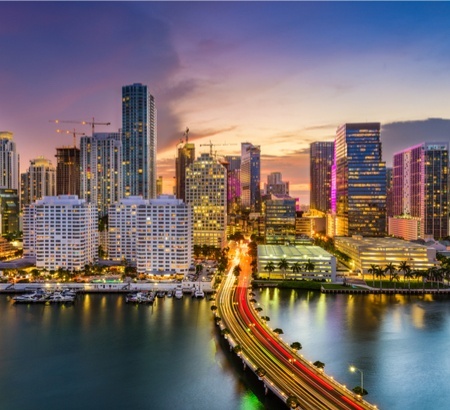 Travelers often consider Miami to be one of the top vacation destinations in the country. Where else can you find beautiful beaches, delicious food, and warm weather year-round, all wrapped up in a cultural melting pot? There is so much to experience in Miami, and what better time than for a destination birthday bash! If your group is flying into Miami from other major cities like Atlanta, Charlotte, Nashville, or beyond, a private bus can be arranged to pick up your group at Miami International Airport. Miami locals can also benefit from renting a charter bus for a special weekend out on the town. At Falcon Charter Bus, we pride ourselves on providing the transportation services needed to make your group weekend unforgettable. Public transportation in Miami is difficult to navigate and rideshare apps can be just as hard for large groups. Don’t stress about coordinating the logistics of everyone getting to and from airports, hotels, restaurants, and lounges. The fleet of buses we charter includes comfortable amenities and professional drivers to safely transport your group. Renting a private charter bus or minibus will ensure your group is focused on the good times ahead and not worrying about how they’ll get there. We’ve created a sample itinerary you can use as a guide through your nights in the Magic City. As hotspots for birthday celebrations, these popular destinations are approved by locals and tourists alike. After flying into Miami International Airport, board your personal charter bus and head off to your hotel to relax and recharge after a long flight. The Mandarin Hotel Miami is one of many luxury hotel options located in Brickell, a hip developing area just south of downtown. Once everyone is decompressed a bit from the flight, enjoy a relatively relaxed evening with delicious dinner at Perricone’s Marketplace and Cafe before the weekend of festivities begins. Enjoy wine and Italian food at Perricone’s before returning to the hotel and heading upstairs to MO Bar + Lounge for a nightcap and live jazz music. Miami International Airport is huge and nearly a city within itself. When flying into Miami, give yourself plenty of time to get through the airport and wear your most comfortable shoes, as a fair amount of walking to terminals may be required. The Mandarin Miami is a highly-recommended hotel among customers and many other tourists who choose to stay with the luxury chain internationally. The 5-star hotel is located on Brickell Key and has stunning water views overlooking the bay. This classic Italian restaurant offers a rustic ambiance and has become a staple in the downtown area for delectable food and an extensive wine selection. Located above the Mandarin’s lobby area, MO offers water views, live Cuban jazz and an array of handcrafted cocktails. The lounge also offers happy hour Monday through Friday, 5:00 p.m. to 8:00 p.m. for visitors desiring to grab a drink a little earlier. Today, the real party begins! Spend a day in the sun on Miami Beach with your group of friends. First things first: brunch is on the menu. Head over to Yardbird, a highly-recommended eatery, and indulge in their southern-style brunch menu. The hearty brunch menu may be a little heavy for some visitors, but Yardbird offers lighter options as well. When everyone is full and ready to head out, hop back on the charter bus and ride over to the beach. Your group can camp out and find your own spot along the stretching expanse of Miami Beach. Alternatively, make a cabana reservation over at Nikki Beach on South Beach, one of the area’s hidden gems. Nikki Beach reservations include cabana service and live music during Rosé Saturdays. Dance all afternoon, sip on tasty drinks, hit the water, and cool off in the cabana. Spending the afternoon in the sun can be a bit draining. Once everyone is a bit tired out at Nikki Beach, head back to the hotel for a little siesta before continuing the evening in Wynwood, an up-and-coming neighborhood filled with art and nightlife. Your charter driver can bus everyone over to the area to appreciate the bustling venues, galleries, and bars. Lagniappe House, a wine bar and music venue located in Midtown directly near Wynwood, has an extensive selection of wine, intimate indoor and outdoor seating, and live music. To end the evening right, Coyo Taco in Wynwood is open until 3:00 am serving famous tacos and other taqueria fares. Renting a charter bus for the weekend ensures you and your group enjoy the weekend to the fullest. Meaning you have a built-in designated driver after hitting Coyo Taco’s secret tequila bar. Although Miami is in the south, the melting pot of cultures can make it difficult to find a southern-style restaurant. Yardbird brings the southern flair to Magic City brunch. Going to South Beach becomes a whole new experience when you book space at a private beach club like Nikki Beach. It offers food, drinks, music, and a clean, private spot on the beach. Lagniappe has been voted one of the best wine bars in America and is a local hotspot for meeting friends and enjoying live music every evening. With a handful of locations in Miami and the Caribbean, Coyo has become a Miami staple for Mexican street food. The “secret” tequila bar in the back may not be that much of an actual secret anymore, but it is still a great spot for tequila lovers. The weekend is winding down and it’s almost time to leave the Magic City. Before heading to the airport, make the most of your last day with a Latin rooftop brunch at Area 31. Immediately after brunch, experience a little bit of Miami history at the immaculate Vizcaya Museum and Gardens. Choosing a charter bus rental for major transportation is great when traveling to the airport! You can leave your luggage and bags in the bus while you go about your day before checking in for your flight. Area 31 sits atop the Kimpton EPIC Hotel and serves fine dining with an international flair and a view overlooking the city. Vizcaya was built as the private estate of Miami mogul and businessman James Deering in the early 1900s. The estate is now a museum boasting Italian-style architecture and lush gardens. Falcon Charter Bus is the premier choice for both long-distance and local group transportation. On top of birthday celebrations and private events, charter buses are great transportation options for school trips, wedding services, corporate events, and more. We serve neighboring Florida cities as well, spanning from Fort Lauderdale to Tallahassee to Tampa. Our reservation representatives are available around the clock to assist in any of your rental needs. Give us a call at 305-359-3962 for a free quote today!